Carpenter bees are a common bee that can be found all throughout the world. They’re quite large measuring about ¾ of an inch to 1 inch. They resemble bumble bees but have a hairless, and shiny black abdomen. 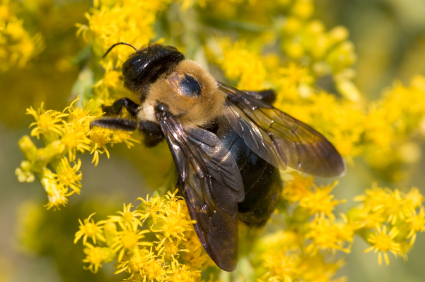 In the spring, carpenter bees awake from hibernation and begin pollinating flowers. The pollen and nectar gathered by female bees is used to create a dough-like mass, referred to as â€œbee bread,â€ which she uses to feed her young. These bees get their common name from their love of wood. Carpenter bees like building their nests in dried wood, bamboo, and frame buildings. The wood is also chewed by the bees and used as material for building their nests. When you see these bees buzzing around a nesting site, those are usually the males. Males cannot sting but will harass nearby insects or people in order to protect the hive. Females can sting, but usually don’t leave the hive very much.